You want to build a fence to keep your neighbor's dog out of your back yard. The easy part is just saying, “I will build a fence.” After that, however, there are all sorts of details to consider. Of course, the big consideration is how much will the fence cost. Before you can determine that figure there are questions that need to be answered. Where is your property line? How tall will the fence be? What materials will be used to construct the fence? Who will do the work? After it's in place will it actually keep the neighbor's pooch on his own side? Any responsible home owner would go through this process before launching such a big project, right? Then why shouldn't government do the same thing? This brings us to the proposal to build a wall along the Mexico/U.S.A border. Take all the politics out of it. Just consider the logistics. Building such a wall has some very real and formidable challenges. Okay, let's assume all the legal issues are sorted out. At that point you have to have to decide what type of wall you plan to build and realistically calculate the cost. 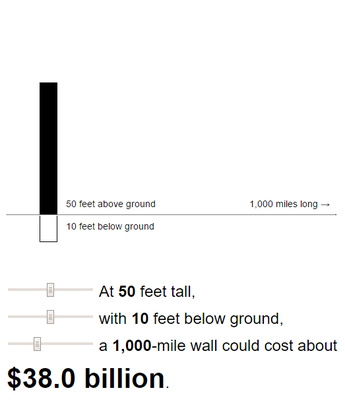 The wall most often referenced by proponents is “35 to 65 feet of concrete reinforced with steel.” The cost bandied about is between $8-12 billion. Which brings us to who is going to build the wall. Who will do the actual work? You are going to need architects, engineers, skilled trades, and builders who know what they are doing. Anything else and you'll have a boondoggle of epic proportions and a final product that will be a rickety mess. I leave it to you to decide if a wall should be constructed between the U.S. and Mexico. Politics and personalities aside, the logistics offer an interesting perspective. This is an image of the MIT cost calculator for a proposed wall. To run the calculator for various dimensions, click here.